DOWN IN the hills at the foot of Carmel, the unrecognized Queen of the Universe hastened to the home of Her cousin, Elizabeth, whom She knew --- by a messenger from Her Royal Consort --- to be with child. When She entered Her cousin's home, Saint Elizabeth did not know how to thank Her and, filled with humility, burst forth in the exclamation: "And whence is this to me that the Mother of My Lord should visit me?" (Luke, 1, 32). And so, too, when Our Lady visited this vale of tears with an assurance of salvation, She brought Salvation with Her. As formerly She had "contained Christ as manna in the ark of Her womb, and brought Him forth to be the Food and Salvation of the world," (C. a Lapide),  so in giving Herself to us in the Scapular She wills to give us the Food of Angels. In the days of prophecy, Saint Elias saw a cloud appear over Mount Carmel, foot-shaped. It was a vision of Her who was to arise immaculate from the sea of human-kind and to crush Satan beneath Her heel, as She brought forth the Salvation of the world. It is traditional that Elias founded the family of Carmel for Her. But after he had beheld this prophetical vision of Our Lady of Mount Carmel, he went down into the desert and there he partook of another mystery, that of the Holy Eucharist. He had fled to the desert because he feared the wrath of the wicked Queen Jezabel, whose false prophets he had slain on Mount Carmel. He sat heavily beneath a juniper tree and begged God to take away his soul. Instead, an Angel came and fed him a piece of bread. In the strength of that bread, the prophet walked for forty days. The Fathers of the Church interpret it as a prophetical symbol of the Eucharist. The whole meaning of Our Lady, the whole meaning of any gesture on Her part to assure our salvation, is to be found in the thirst of the Sacred Heart for love. This is as true as the fact that a bridge derives its whole meaning from the banks which it joins. Mary has but one desire, a desire born at the foot of the Cross: to see resound from pole to pole the one cry, "Praise be to the Divine Heart of Jesus!" When She comes to this vale of tears with a Sign of Salvation, She does not come to answer only in part that rending cry of thirst, which quivered into Her heart from the parched lips of Her dying Son. 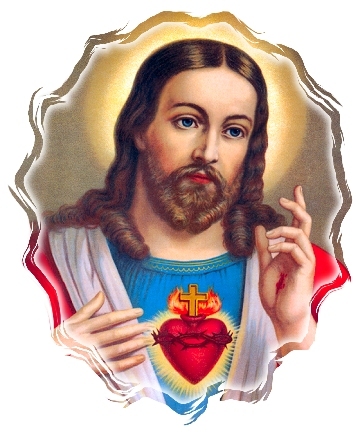 His Sacred Heart rests the world over, motionlessly pulsating in powerless omnipotence behind the doors of tabernacles constructed by human hands. Hence, when Mary comes to us making a promise of Salvation, bearing the Child Jesus on Her arm, whither does She intend to turn our hearts? What means of salvation would this Blessed Mother impart to us other than a share in Her own deep love for the Sacred Heart? Once while Saint Gertrude was reciting the Salve Regina.. Our Lady appeared with the Infant Jesus on Her arm. Just as Saint Gertrude said: "Turn thine eyes of mercy towards us," Mary pointed to the eyes of Her Divine Son and said: "These are the most compassionate eyes that I can turn for their salvation towards all who call upon me." Those who enter the Scapular Devotion, in the manner about to be described, will surely feel an attraction to the tabernacle. Our Mother has instituted an easy yet perfect devotion to Herself because She knows full well that God has made Her the perfect way to Him; She knows that where there is devotion to Her, there will soon be devotion to that unsoundable Heart which is cached under the. wafer-species in order to join and love --- inflame all human hearts. At once this opens to us a new appreciation of that perfect devotion which Mary instituted by a Promise. When Blessed Angela of Arena was hesitating about her vocation, she also had a vision of a ladder to Heaven: two saints appeared to her and said that if she wished to ascend that ladder, she should take the Habit of Mary, the Scapular. For, in the Scapular, Mary has given us Herself, the true ladder to Heaven. She has pledged Herself to us and has become continually present to us in a moral and effective manner. She has thus given us God's own way to Himself. As was mentioned in our treatment of "Mary's sacrament", to merely wear the Scapular is but to obtain a minimum of Marian treasure and to ignore the very best aspect of Our Lady's gift --- namely, that She is present to us and that we need but deepen our union with Her to obtain union with Our Lord. Through His vicars on earth, Jesus seems to be asking from the tabernacle, a state so similar to His Infancy in Mary's womb, that we come to Him as other Immaculates: "Can anyone fail to see," asked Pius X, "that there is no surer or more direct road than by Mary to unite all mankind in Christ, that we may be holy and immaculate in the sight of God?" And in the Scapular Promise, it seems that Mary, who first brought us that delightful Food of Angels, has come to clothe us with Herself that we may approach that Blessed Eucharist immaculately, to be consumed by Its divinizing power and flaming love. From Mount Carmel, from the vision of the Immaculate crushing Satan, we are drawn to the tabernacle. Jesus and Mary are one. If we find Mary, we find Jesus. If we become united to Mary, we become united to Jesus and in a way most pleasing to Him; it was He Who first came to us through Her. Now, the Scapular Devotion is one that renders union with Mary natural and easy. And by "union", we do not mean here merely the fundamental moral union that actually constitutes the Scapular Devotion but that deeper union with Mary which causes the likeness of Christ to appear in souls and brings about a new and undreamed of intimacy with Him. 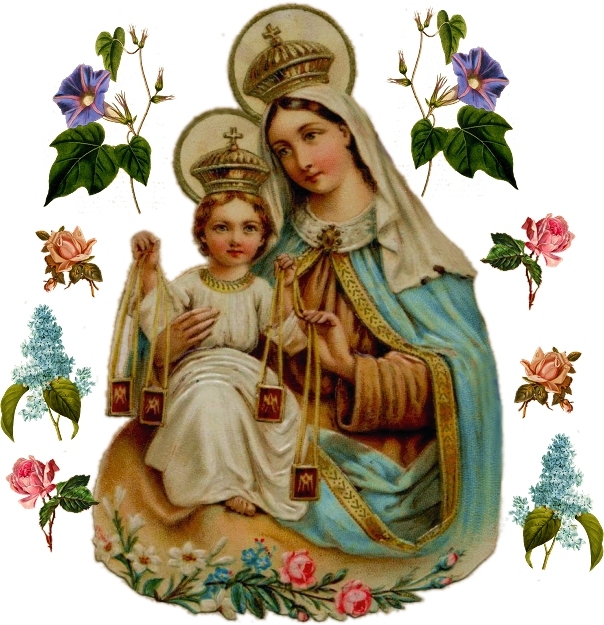 Elsewhere we have seen that the wearing of the Scapular imports the practice of a true devotion to Mary: a devotion of homage, confidence and love. In this true devotion we necessarily give Mary our minds (homage), our wills (confidence), and our hearts (love). A moral union results, but it is a union not deep enough to cause us to live in Jesus, through Her. This deeper union results only from the practice of a PERFECT devotion, a devotion not only of mind and heart and will, but of the whole being. This devotion requires that we add to our homage, confidence, and love, the element of IMITATION. And it is here that the Scapular, besides laying the foundation of a lesser union, becomes a great aid. Sacred Scripture says: "The Queen stands at Thy right hand clothed in gold, surrounded by variety." The Queen stands because She did not ascend to Heaven to rest, but to watch over Her children and to constantly aid them to union with Her Glorified Son by Her prayers and melting love. She stands at the right hand of Her Son, watching and praying over us --- being a Mother. But why has She clothed us in a dark garment while, in Heaven, She is clothed in gold, surrounded by many various colors? Is it not that we are to do as She did on earth: make it a garment golden with love and surrounded by the variety of all the virtues that flow from love? Mary, in the Scapular we wear, seems constantly to say to us: "Love God! and here is my heart with which to love!" For, as Our Lord in procuring our salvation left nothing undone to win our love, Mary has left nothing undone to win our love to Her Son in assuring our salvation. She not only assures us of Her mediation in giving us the Scapular but, like Jesus Who gave not only salvation but Himself entirely, She gives Herself to us during life, at death, and even in Purgatory. For almost seven centuries, by more miracles than have been wrought through any other sign, She has given the Scapular such a redundancy of Herself that, as one writer puts it, "It seems that the bounteousness of Mary has crystallized into this Scapular that it might find itself in more intimate contact with the hearts of Her dearest children." One who wears it devoutly has Mary at his side, sweetly guiding him to fully consecrate himself to Her by imitation of Her love of God. It would be impossible to show in how many ways the Scapular is a symbol of love and of consecration of oneself to Jesus through Mary. Its mysteries are bound into the one unsoundable, love-compelling fact that it is an assurance from the Mother of Sorrows, who stood as the High Priestess at Calvary's altar, that through Her mediation the Precious Blood shed there will be our infallible salvation. Just as the garment which She made for Jesus became a symbol of the complete Passion in being stripped from Him on Calvary, so, too, in being an assurance of the Blood shed that day, this garment is the symbol of all those motives of love. 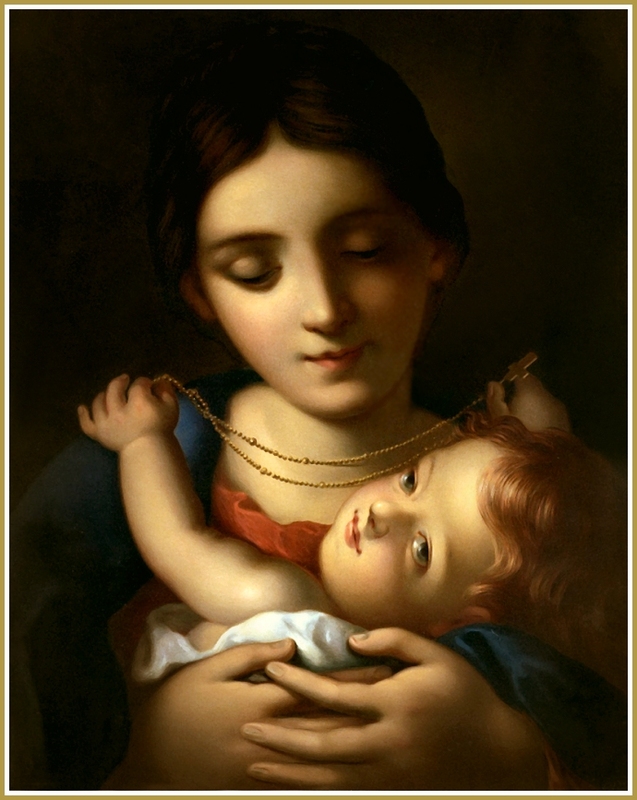 Why did Our Lord make known to the Saint all the tenderness of His Heart when Saint John resolved to practice the virtues of Mary symbolized by his Scapular? Why, indeed, except that to imitate Mary is to go directly and perfectly to Him? Saint Conrad, before entering the Capuchin Order, walked to the nearest town and had himself enrolled in the Scapular. He wore it devoutly all through his religious life with the resolution: "I will always strive to have a deep devotion to Mary, and especially strive to imitate Her virtues." He soon united himself to Jesus through Mary (die Grignionische Andacht), attaining perfection in an astoundingly short time. He spoke of the Divine Hearts of Jesus and Mary as One, a truth he had learned rapidly by sweet experience. The great and rapid triumphs of these two Marian Saints --- John of the Cross and Conrad of Altotten are far from unique. Such triumphs have been the reward of all who have known the secret of "to Jesus through Mary". Saint Therese of Lisieux is an example worthy of special attention because she is like a messenger to this century, announcing that the blissful state of union with Jesus through the Scapular Queen is not an unrealizable utopia. Saint Therese astounded the world by giving Jesus a love that has almost been unparalleled in the whole history of the Church and then saying: "All little souls can imitate me!" She declared that everyone could achieve her perfection and from the age of three she never refused God anything! What is the explanation? Ah, what indeed but union with Mary? This is the secret Therese began to keep from the moment of her miraculous cure, in her in- fancy, by Our Blessed Lady. She made herself a living reproduction of the Immaculate Conception and did not fear to approach Our Lord with the disarming, child-like love that arose from her union with Mary. Hence we say that Mary, in the Scapular, presents Herself as our way to the Sacred Heart. She invites us to Her perfection, which fructifies in union with the Sacred Heart. Father Faber says that: "All our life is nothing but a succession of visitations, visitations from Mary bringing Jesus with Her, but nowhere is this similitude so faithful as it is in the Eucharist." In giving us a true devotion to Herself, Mary gives us, little by little, a true devotion to Our Lord in the Blessed Sacrament. In uniting us to Herself, She is drawing us into the paradise of the Sacred Heart. Our Communions will take on a new significance: "Jesus," says Blessed Grignion de Montfort, "is always and everywhere the fruit of Mary and Mary is everywhere the veritable tree that bears the Fruit of Life and the true Mother who produces It." "To Mary alone," this same Saint declares, "God has given the keys to the cellars of Divine Love with the power of entering into the most sublime and secret ways of perfection and the power of causing others to enter in also." And by the Scapular, Mary has declared that we shall be Saints in Heaven. Therefore She is desirous of making us Saints on earth. She desires to present Herself to us that we may, become closely united to Her, the Immaculate, and thus be wholly pleasing to Jesus. She invites us, presenting to us an assurance of salvation that is also a symbol of Her virtues, to come to Her by imitation. Thus when Our Lady came to make the Scapular Promise, folding the Mystical Body to Her bosom with those powerful words "Shall not suffer eternal fire," She made a gesture towards the fulfillment of Her mission. It is Her mission to give the Incarnate Word to mankind, and She has taken us under Her Mantle where we can easily partake of Her immaculate purity and be worthy, as little children, to receive Her Son. 1. St. Alphonsus: Glorie, t. I, pg. 208. 2. Cornelius a Lapide: Pro Fest. V. M. s. 12, a. 1. 4. Our Lady in the Blessed Eucharist: pg. 18. 5. Glorie: I, viii, 1. 6. Wadding. Ann. 1232, n. 28. 7. B. Grignion de Montfort: La Vraie Devotion a la tres Sainte Vierge (Tours, 1933, nos. 31 and 50). 8. Pulpito: t. I. pg. 38. 9. Encyc. on Jubilee of the Immaculate Conception; Cf. R. P. Husslein, S.J., All Grace Through Mary (New York, 1934, pamph., pg. 4). 10. Pulpito: t. II, pg. 269. 11. Chroniques du Carmel, Vol. I, pg. 100. 12. R. P. Anton, O.M. Cap., Im Dienste Gottes und der Menschen, pg. 48. 13. R. P. Taylor, Saint Therese of Lisieux: An Autobiography (New York, 1926), pg. 232. 14. Letter of Sr. Anne of Jesus to present author (Sept. 6, 1937): "En pratique Sainte Therese de l'Enfant Jesus a imite Ie Bx. Grignion de Montfort puisqu'elle a fait passer son acte d'offrande a, l'Amour misericordieux par les mains de la tres Sainre Vierge, mais elle ne connaissait pas la devotion a Marie dite du Bx. Grignion. Sous un autre pli nous vous envoyons un livre sur la devotion de Sainte Therese a la Sainte Vierge. Vous y verrez ce qu'est la spiritualite mariale de Notre Sainte." N. B.: The book sent was Pour Aimer la Ste. Vierge commeter Ste. Therese, by R. P. Martin (Luc;on, 1935). Sr. Anne's let.ter is quoted here exactly because some recent authors are not quite in agreement. 15. S. Jean Eudes: Le Coeur Admirable de la Ires Sainte Vierge (Paris: Lethielleux, 1935), pg. 195. 16. Letter to author: Nov. 5th, 1936. 20. Op. cit., no. 44. 21. See ref. 24, ch. 3. 22. Scala coelestis, quia per ipsam Deus descendit ad terras, ut per ipsam homines mereantur ascendere ad coelos. In Annunt., s 1. 23. Glorie: t. I, ch.. v, paragraph 2. 24. Op. cit., no. 120. 25. Meditations (From Select Works: London, 1884) sub festo. 26. See ref. 18 of ch. 2.